Often our most cherished pieces of furniture are the ones that we know had a life before us. Like a new partner, they come to us with a certain amount of baggage; a history that we will never understand or be able to place ourselves in. The allure of this kind of enigma accounts for a large part of the popularity of flea markets and second-hand shops – the bargain prices may even be completely inconsequential for some enthusiasts of pre-loved objects. But possibly more exciting than finding, for example, a beautiful vase and knowing that is has always been a vase, though previously someone else’s vase, is acquiring an object that used to be an object of a completely different type. 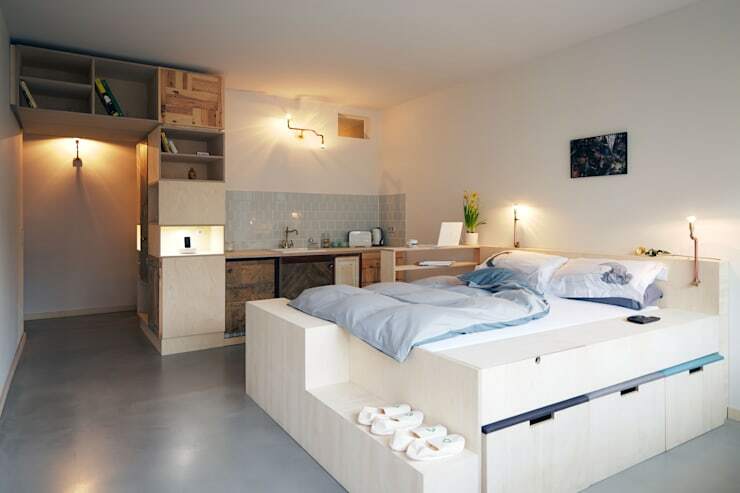 The specific appeal of this kind of furniture is something that is clearly well known to Spamroom, a Berlin-based architecture firm that makes liberal use of recycled materials and objects. 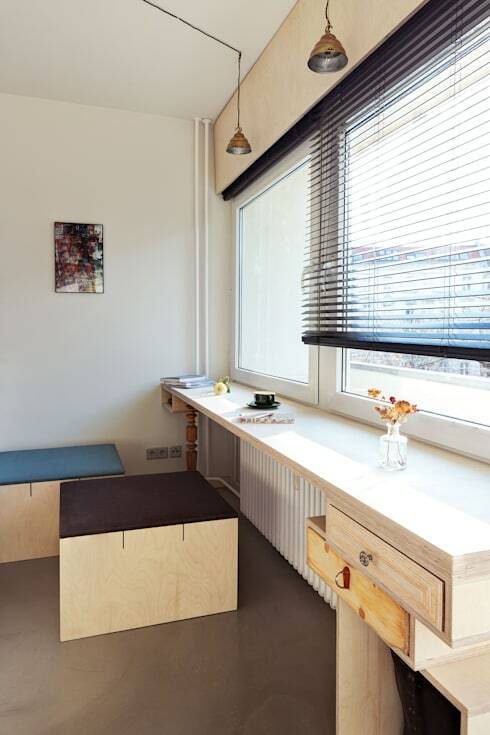 Taking a look around the Berlin studio apartment below, it would be impossible to deny that recycled materials can have an aesthetic value as great as their environmental one. A light palette and cute quirks (such as the inbuilt slipper shelf at the foot of the bed; the attached bedside lights at the head of it; and the matching asymmetrical lights seen on the rear wall) make this bedroom and kitchen area a very friendly space. 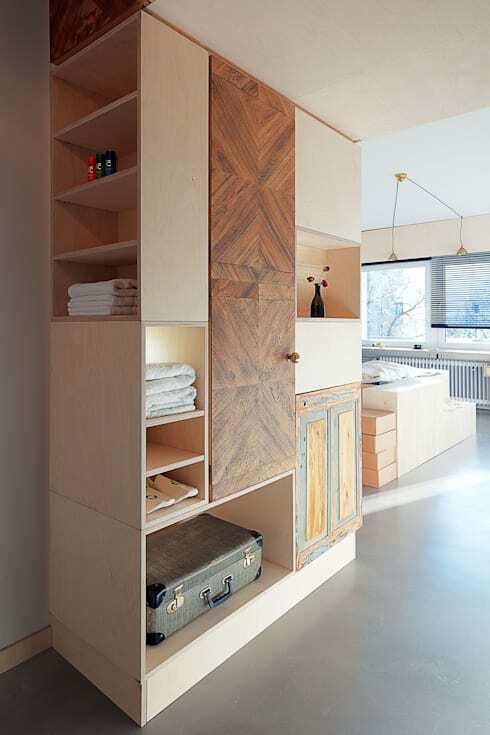 With so little room to work with, maximising storage has understandably been a priority for the designers, hence that big under-bed drawer and the abundance of cupboards in the background. 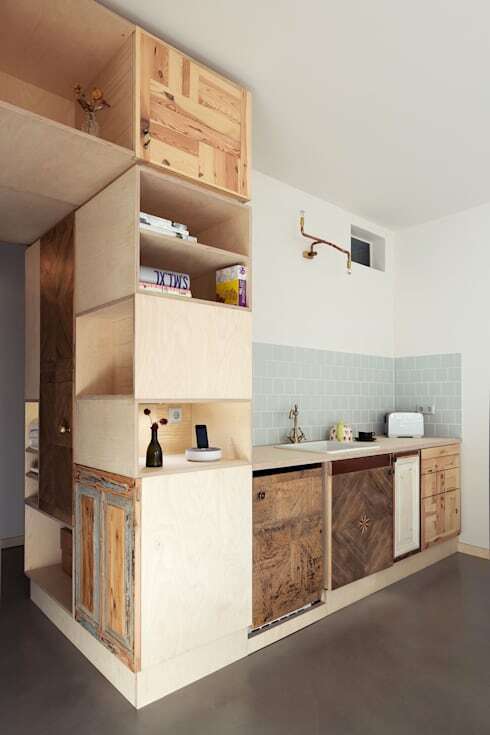 We can already see – though not too clearly – the mismatched doors and surfaces that lend so much charm to this compact little apartment. This shelving unit by the front door offers even more space to tuck things away. It is unusual in a couple of different ways: firstly, the seemingly random layout of its shelves and doors makes it seem thrown together, in a way that is quite endearing; and secondly, the doors themselves obviously have their own stories to tell. 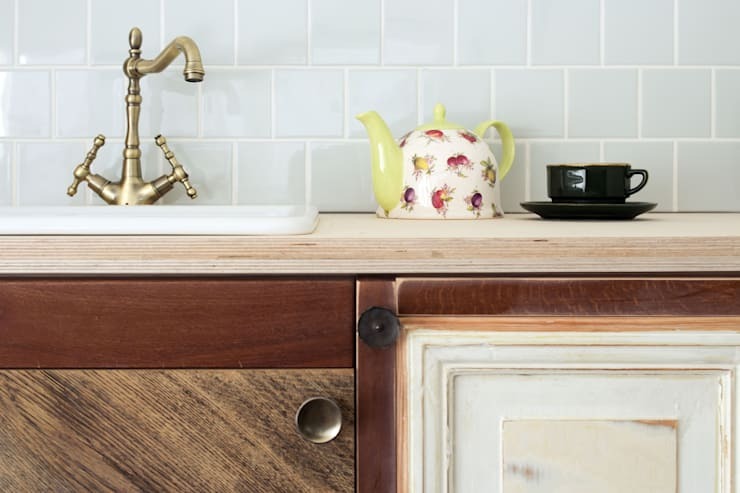 Although each one clashes with the other, the style of the unit containing them is so neutral and understated that they really do work as a design feature. Back to the kitchen space, where there’s yet more recycled wood to wonder about. Because the rest of the apartment is so consistently uncomplicated, this aspect of its design is the focal point throughout. And yet there are plenty of other decorative touches to admire, even if they’re less immediately apparent. 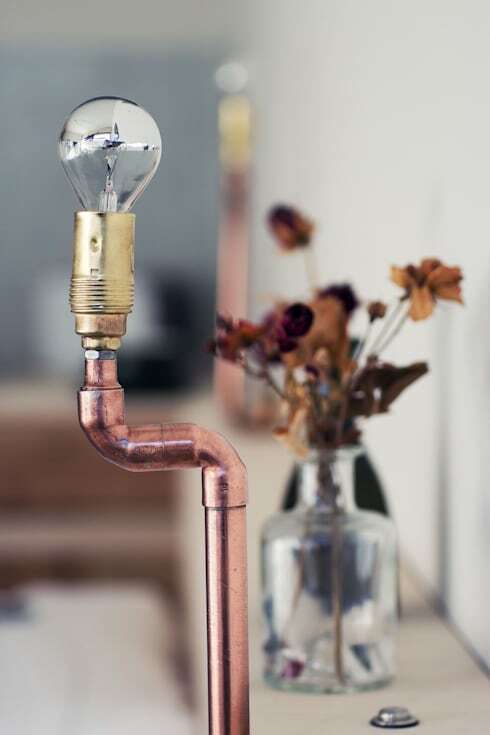 The brass taps over the sink give a sweet vintage edge to an otherwise very modern home, while those twin lights are even stranger and lovelier up close than they were from afar. Because the doors all come from different places, their door handles and knobs naturally appear at different heights. As haphazard and messy as this perhaps ought to look, it in fact suits the apartment far, far better than if the door knobs had been carefully repositioned. Here’s a closer look at those very special lights, which appear next to the bed, over the kitchen and in the hall. Well, it’s kind of a dining room. The most important thing is that there are seats, and a person could easily dine here – and watch the world going by while doing so.